ANdAL pAtti : vyAsa and parAsara! I m going to kAttazhagiyasinga perumAL sannidhi (a separate temple for narasimha perumAL). Do you want to join me? vyAsa: Sure pAtti. We will join you. Last time you were telling us about AzhwArs. Can you tell us more about them now? ANdAL pAtti: Good that you have asked, I will tell you both about them now. All three of them start walking towards kAttazhagiyasinga perumAL sannidhi. ANdAL pAtti: There are 12 AzhwArs in total. The collection of all their songs is now known as ‘nAlAyira (4000) dhivya prabhandham’. Infact, amalanAdhipiran, the one I recited yesterday is part of this collection of dhivya prabhandham. parAsara: Oh! Who are those 12 AzhwArs, pAtti? 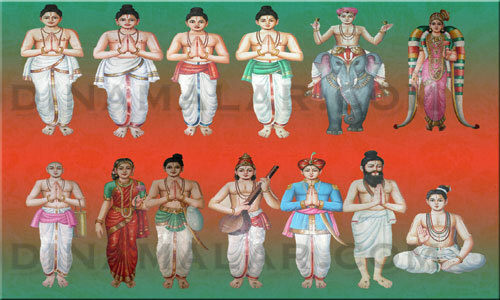 ANdAL pAtti: The 12 AzhwArs are poigai AzhwAr, bhUthathAzhwAr, pEyAzhwAr, thirumazisai AzhwAr, madhurakavi AzhwAr, nammAzhwAr, kulasEkara AzhwAr, periyAzhwAr, ANdAL,thoNdaradippodi AzhwAr, thiruppANAzhwAr, thirumangai AzhwAr. 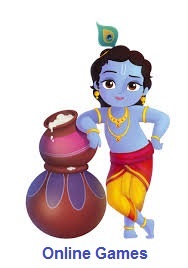 vyAsa: Nice, pAtti. So they are the ones who had the great mercy of perumAL? ANdAL pAtti: Yes, vyAsa. They were fully blessed by bhagavAn. After being blessed, out of great care towards other people in this world, they shared the mercy of perumAL through their pAsurams (songs) thousands of years back. It is through those pAsurams we are understanding about bhagavAn and we are enjoying glories of perumAL. parAsara: Oh! pAtti, I thought we understood bhagavAn through vEdham. ANdAL pAtti: Yes. Definitely. But vEdham is very big. There are many complex matters which are explained in samskrutham in vEdham that are difficult to understand without deep study. But, AzhwArs brought about the essence of vEdham in simple thamizh language in these 4000 pAsurams. And as you well know, the essence of vEdham is to glorify perumAL. More so, AzhwArs acquired their knowledge by the direct grace of bhagavAn instead of their self-effort – so it is all the more special. vyAsa: Yes, we understand this now. AzhwArs were kindly explaining about perumAL in much simpler and focussed way. Just like you are explaining these matters to us now. ANdAL pAtti: Very nice vyAsa – that is very good example. Now, you remember, previously we discussed that perumAL exists in 5 different forms – in paramapadham, in vyUham, avathArams, antharyAmi and archA form. 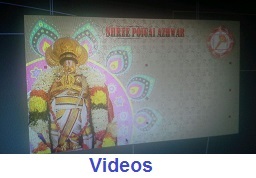 Different AzhwArs had attachment towards different forms of perumAL. parAsara: Oh – just like we like srI ranganAthan so much, did each AzhwAr had their own favourite perumAL? ANdAL pAtti: Yes. mudhalAzhwArgaL (First 3 AzhwArs – poigai AzhwAr, bhUthathAzhwAr, pEyAzhwAr) were very attached to perumAL‘s supremacy – as seen in paramapadham. thirumazisai AzhwAr had great attachment towards antharyAmi – the perumAL inside the heart of each one of us. 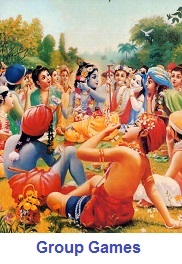 nammAzhwAr, periyAzhwAr and ANdAL had great attachment towards krishNa. kulasEkara AzhwAr had great attachment towards srI rAma. thoNdaradippodi AzhwAr and thiruppANAzhwAr had great attachment towards srI ranganAthan. 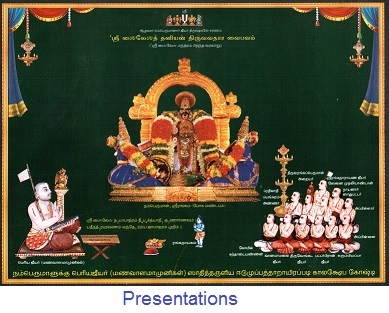 thirumangai AzhwAr had great attachment towards all archAvathAra perumALs. 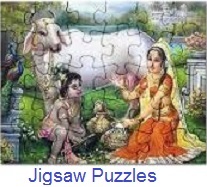 vyAsa and parAsara: pAtti, you left madhurakavi AzhwAr. ANdAL pAtti: Yes – very nice observation. madhurakavi AzhwAr was fully devoted to nammAzhwAr. ANdAL pAtti stops at a flower vendor’s shop to buy some flowers for perumAL. parAsara: pAtti, Can you now tell us about each AzhwAr? ANdAL pAtti: Surely. But now we have arrived at the temple. We will go inside and have his dharsan and glorify him. Next time, I will explain more about each AzhwAr in detail. vyAsa and parAsara: OK pAtti. Let us go in – we cant wait to see narasimhar any more. This entry was posted in Beginner's guide, Stories on October 4, 2014 by Sarathy Thothathri.